CABLE HIGHLIGHTS: Discovery’s GOLD RUSH led Friday cable, up 0.09 to 0.88, with lead-out FINDING ESCOBAR’S MILLIONS down 0.03 to 0.37. A&E’s LIVE PD rose 0.05 to 0.63. ESPN’s NBA doubleheader was at 0.59/0.55. The season finale of HBO’s REAL TIME WITH BILL MAHER fell 0.17 to 0.42, and TRACEY ULLMAN’S SHOW was down 0.05 to 0.09. 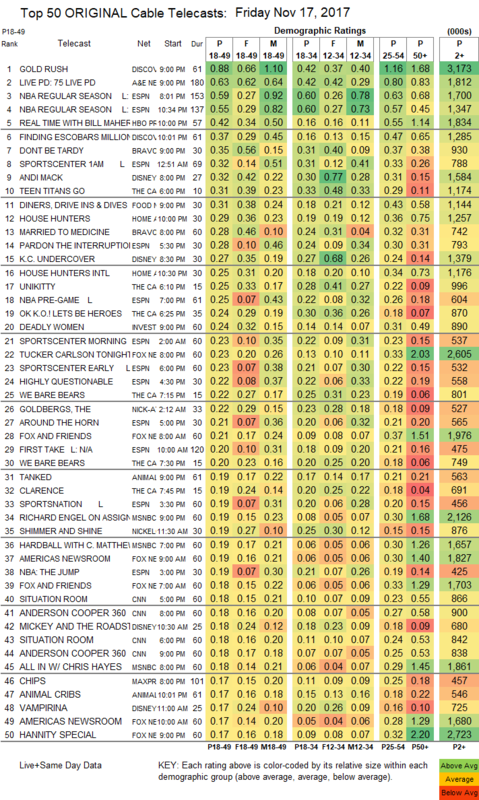 Bravo’s DON’T BE TARDY (0.35) and MARRIED TO MEDICINE (0.28) were both steady. Disney Channel’s primetime ANDI MACK jumped a tenth to 0.32, and KC UNDERCOVER was up 0.05 to 0.27. Cartoon Network’s early evening TEEN TITANS GO gained 0.04 to 0.31, with lead-outs UNKKITTY at 0.25, and OK KO LET’S BE HEROES steady at 0.24. Food Network’s DINERS’ DRIVE-INS & DIVES dropped 0.05 to 0.31. On HGTV, HOUSE HUNTERS remained at 0.29, and HOUSE HUNTERS INTL was up 0.02 to 0.25. ID’s DEADLY WOMEN ticked up to 0.24. 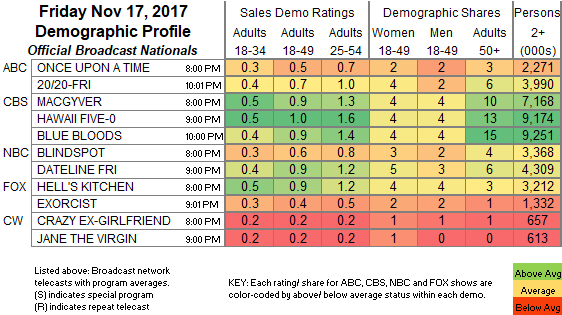 On Syfy, Z NATION ticked down to 0.17, and SUPERSTITION was steady at 0.09. We’s MARRIAGE BOOT CAMP lost 0.04 to 0.16. Spike’s BELLATOR shrank by 0.05 to 0.14.